Like any floor covering, real wood floors will show signs of wear over time, depending on the size and lifestyle of your family. But by observing a few precautions and using the cleaning and maintenance program recommended by the manufacturer, you can expect years of beauty from your wood floor. 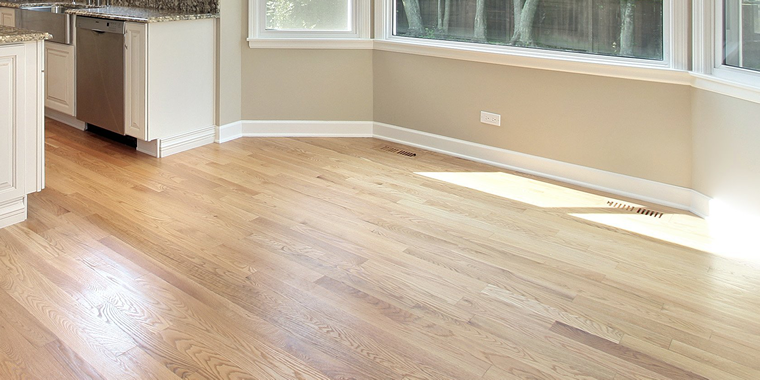 Never clean or mop your hardwood floor with water or steam. Do not use any wax or cleaner that must be mixed with water such as oil, soap or paste wax products, or other household cleaners that contain lemon oil, tung oil or ammonia as this may damage your floor and result in a loss of warranty. Carpet One Floor & Home recommends Resista Hardwood Floor Cleaner for the routine maintenance of your hardwood floor. Follow the cleaner’s recommendations provide on the cleaning container. Water can dull the finish and permanently damage the floor. To help eliminate fine particles of dirt and grit that act like sandpaper and will scratch any floor, vacuum or sweep daily. The vacuum head must be a felt or brush type. Be certain that the wheels of the vacuum are clean and do not damage the finish. DO NOT USE A VACUUM WITH A BEATER BAR HEAD, UNLESS THE BEATER BAR IS SWITCHED OFF. Remove spills promptly using a soft cloth and Resista Floor Cleaner or other cleaning products recommended by the manufacturer. Be sure to keep pet nails trimmed and paws clean and free of dirt, gravel, grease, oil and stains. Place protective pads beneath furniture legs to reduce scratches and dents. Use a dolly and protective sheets of plywood when moving heavy objects, furniture or appliances. Some objects may be too heavy to move across a hardwood floor under any circumstances. Certain types of casters on furniture may damage hardwood flooring. Barrel-type wheels (a minimum 1” continuous width is recommended) or wide, flat glides are best for protecting your hardwood floor. A humidifier is recommended to prevent excessive shrinkage of wood floors due to low humidity levels. Wood stoves and electric heat tend to cause very dry conditions. Proper humidity levels can be maintained with an air conditioner or dehumidifier, or by periodically turning on your heating system during periods of high humidity in the summer months. Relative humidity in the area of use must be kept within a normal range. Wood flooring will perform best when the interior environment is controlled to stay within a relative humidity of 30-50 percent and a temperature range of 60 degrees to 80 degrees Fahrenheit. (In some climates, the ideal humidity range might be higher or lower 25-45 percent or 45-65 percent, for example). * The use of a hygrometer (humidity gauge) is highly recommended. Exposure to the sun and its UV rays accelerates the oxidation and aging of wood and fabrics. This causes the stain and/or wood to fade and/or change color. It is recommended that you rearrange rugs and furniture periodically so the floor ages evenly. Remove shoes with spiked or damaged heels before walking on the floor. Spike or stiletto high-heel shoes may cause denting and related damage to hardwood floors due to the extremely high compressive force they generate. Such footwear can produce dynamic loads in excess of 1000 pounds per square inch, even when worn by someone of slight or average build. As added protection, use dirt-trapping walk-off mats at all exterior doors to keep sand, dirt, grease and oil off your hardwood floor.